You will NEVER forget the first seen ashen-faced zombie (Ben Harris) in this movie. I promise you. That cackle! That expression! It is a scene, in which the zombie chucks a woman’s body over a ledge, that will linger with you thanks to the crazed look glued on the face of this zombie. I still have nightmares to prove it and, as this is coming from a very Sir Arthur Conan Doyle-like script, that fact of sheer terror is astounding. "The tension in this classic film creeps up unexpectedly and lingers thanks to a clever pacing, a smart script, and an above average handling of the subject of zombies"
The opening three minutes of Hammer’s The Plague of the Zombies is a testament to the sheer power of horror. The voodoo drums are hypnotizing. So, too, is the bizarre blood ritual being performed by a masked figure in a cloak. There is blood spatter everywhere. But that fact does not seem to bother the concentration on display by both the drummers and those participating in the ritual. There is a sudden chanting and then, rather shockingly, we cut to a woman in bed. She is mumbling the same words in the incantation while she sleeps . . . restlessly. And then the blood is poured and she wakes up screaming. In this manner, director John Gilling’s The Plague of the Zombies begins its haunting and twisted spell over its audience. To this day, this Hammer Production simply cannot be toppled. It is mesmerizing and beautiful in its rollout as a little hamlet in Cornwall suffers from a BIG problem: young men are dying at an alarming rate. And then, deepening the mystery, they are seen living again, working in an long forgotten mine. Ironically enough, the first cerebral treatment of the whole zombie epidemic has the walking dead working for metal instead of brains. They are slaves. Starring André Morell, Diane Clare, and Brook Williams, The Plague of the Zombies is what happens when a professor and his daughter go sniffing around in order to get to the bottom of the mystery that surrounds this village. Twelve men have died! One a month for this sleepy village. And now, after a healthy dose of that old black magic, it is up to a couple of out-of-towners to figure out the truth. The Plague of the Zombies is a thoughtful production that totally immerses its audience in the atmosphere and the paranoia of this sleepy village. The set designs, as is usual for a Hammer Production, are exemplary. Even if most of these sets (including the village) are recycled from The Reptile, here they find purchase as some serious questions are raised about the reasons for the deaths of these young men. There are a number of great scenes sprinkled throughout this film. The hunting of the professor’s daughter. by the gang of men in the red jackets. That opening scene. Hell, from running after a friend as she enters the abandoned mine to the massive shadow of a hand as it spreads across Alice’s face, The Plague of the Zombies is a fine, fine film, daring to do something SMART with the horror genre. The tension in this classic film creeps up unexpectedly and lingers thanks to a clever pacing, a smart script, and an above average handling of the subject of zombies . . . a couple of years before George A. Romero’s classic film, Night of the Living Dead. 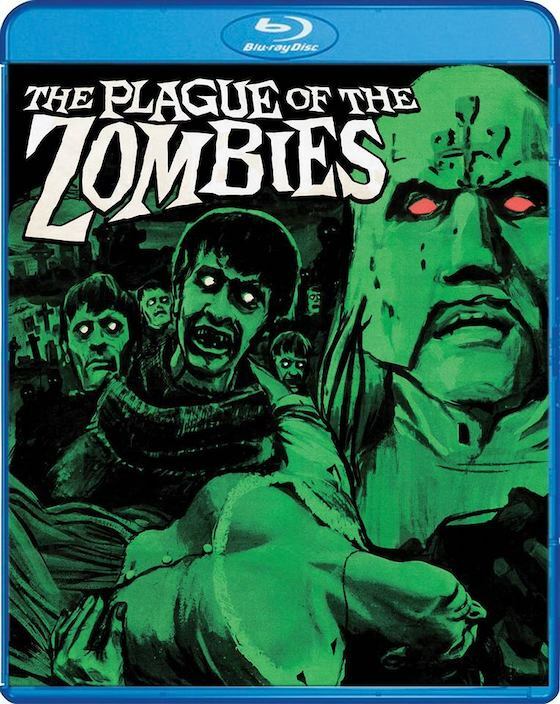 And now, thanks to this restoration from Scream Factory, The Plague of the Zombies arrives on blu-ray. Working on the undead chain gang never looked as glorious as it does here on this release. 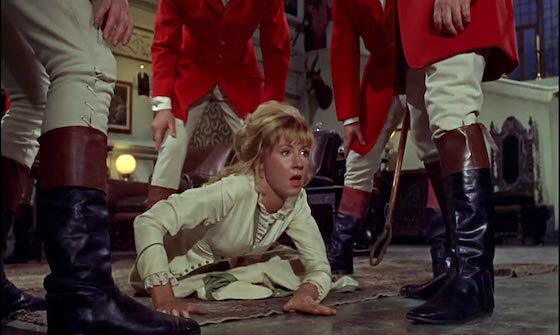 Memorable Movie Quote: "I, I find all kinds of witchcraft slightly nauseating and this I find absolutely disgusting." Synopsis: In a remote 19th-century Cornish village, an evil presence lurks within the darkness of the witching hour. A mysterious plague relentlessly consumes lives at an unstoppable rate. Unable to find the cause, Dr. Peter Tompson enlists the help of his mentor, Sir James Forbes. Desperate to find an antidote, they instead find inexplicable horror: empty coffins with the diseased corpses missing! Following a series of strange and frightening clues, they discover a deserted mine where they discover a world of black magic and a doomed legion of flesh-eating slaves ... the walking dead! Say whatever you want to about whether or not you believe in the possibility of zombies because the beauty of this release will have you believing in the walking dead. The colorful restoration of this horror film is a thing of crackling beauty. Released via Shout! Factory, the detailed 1080p image is beyond crisp and colorful, suggesting details in never seen before. Black levels run deep. Shadows are thick and defined. There are few fuzzy scenes; everything is crisp, crisp, crisp. Film grain is solid, too. No pops, crackles, or hisses. The DTS-HD 2.0 Master Audio track is strong with absolutely no distortion. Simply put, The Plague of the Zombies has never looked or sounded better. This classic comes loaded with new commentaries, new audio, an episode of World of Hammer, a look at the making of the movie, a restoration comparison, a still gallery, and theatrical trailers.